Magic happens on stage whenever a team of skilled and like-minded theater artists come together and put forth their best work. The script doesn’t have to be a Pulitzer Prize winner – or even noteworthy; an excellent production team can salvage a clunker, just like a bunch of screw-ups can ruin a classic. I knew very little about “Time Stands Still” before I attended the opening night performance at Performance Network Theatre. But one look at the show’s pedigree – direction by Kate Peckham, with Suzy Regan and John Lepard in the lead roles – and I went in expecting an excellent night of theater. Written by Pulitzer Prize-winning playwright Donald Margulies, “Time Stands Still” tells the story of uber-focused photographer Sarah Goodwin (Regan), who returns home from Iraq after suffering a near-fatal injury. She’s recovering at the loft apartment she shares with longtime, live-in boyfriend James Dodd (Lepard), a globetrotting journalist who left Iraq prior to the car bomb explosion that almost killed Sarah. (He witnessed an atrocity and came home for mental health reasons.) Both are in pain, but each refuses to acknowledge it. Emotions are stirred when Richard (Hugh Maguire), their editor and friend, arrives with his half-his-age girlfriend Mandy (Heidi Bennett) to welcome Sarah home. The two, it seems, are madly in love and plan to marry. So James – after nearly losing the love of his life – decides to pop the question to a stunned Sarah. Her answer sets into motion a chain of events neither foresees. Margulies’ script offers theatergoers plenty to think about – and that’s both problematic and a bit confusing. Is this a play about a working couple’s relationship? Or one that explores the role of the photojournalist in both a war setting and in the national consciousness? Either one on its own would make for an intriguing play, but the latter seems shoehorned into the former to give this particular story weight, which only serves to distract the viewer from the meat of the story. 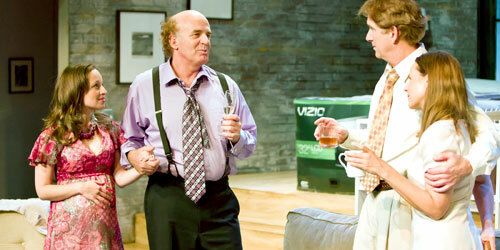 But where the playwright excels is in crafting four complex characters to move the plot forward. And they are perfectly delineated by Peckham and her actors. Regan’s wry delivery shades the dialogue in multiple hues, which provides the audience with an insight not picked up on by the other characters. And what’s not expressed by words alone are underscored by subtle, but delicious changes in her facial expressions. Lepard is also at the top of his game. But the most impactful moments of the play are those the two share alone – on the couch, looking into each others’ eyes. Maguire’s performance looks effortless, while Bennett did an excellent job walking the tight line between “ditz” and being the most insightful character in the play. The action takes place on a very realistic set by Sarah Tanner – bricks and all – that’s well lit by Mary Cole. So while the script for “Time Stands Still” may be slightly flawed, Performance Network’s production of it is anything but. Performance Network Theatre, 120 E. Huron St., Ann Arbor. Thursday-Sunday through Oct. 23. $25-41. 734-663-0681. http://www.performancenetwork.org.